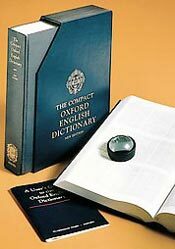 The classic, Compact OED is a smaller, handy version of what is the best English dictionary, bar none, the famous OED. Because it’s photo-reduced, it contains the entire OED, all 20 large volumes in one convenient reference (it comes with a reading glass). Aside from saving space on your shelf, it’s also significantly cheaper. It’s quite large, but you could definitely fit it in a regular backpack, if you’re a student or need to transport it (although it is about 10 pounds!). I’ve been using it for 3 years now, at least twice a week for general queries, as I enjoy discovering and using obscure words and I also often look up words and dive into etymology as part of my Wikipedia editing. For example, recently I used my OED to look up an archaic usage of the word “quaint”. Apparently Andrew Marvell’s “To His Coy Mistress” makes use of the old meaning where “quaint” also refers to female anatomy. Who knew? !